What you are about to read, is what the scientists in the United States are not allowed to tell you in great fear of the Obama administration. They are under the threat of severe repercussions to the max.. Scientists confirming these findings cannot be named due to the above, but what they believe, they want to be known by all. Take a U. S. map, lay it flat and measure inland just the minimum 50 miles of total destruction all around the Gulf of Mexico as to what you will read below. The carnage to the United States is so staggering, it will take your breathe away. Should what the scientists, who are trying to warn everyone about, is even close to be true... all of Florida will be completely destroyed and everyone and everything on it. You decide!! Everyone has the right to read what I have just written in this article, as well as to what is written below by the scientists who the Obama administration and BP are trying to shut up. Please share with as many as you can. The estimated super high pressure release of oil from under the earth's crust is between 80,000 to 100,000 barrels per day. The flow of oil and toxic gases is bringing up with it... rocks and sand which causes the flow to create a sandblasting effect on the remaining well head device currently somewhat restricting the flow, as well as the drilled hole itself. The well head piping is originally about 2 inches thick. It is now likely to be less than 1 inch thick, and thinning by each passing moment. The oil has now reached the Gulf Stream and is entering the Oceanic current which is at least four times stronger than the current in the Gulf, which will carry it throughout the world within 18 months..
At some point the drilled hole in the earth will enlarge itself beneath the wellhead to weaken the area the wellhead rests upon. The intense pressure will then push the wellhead off the hole allowing a direct unrestricted flow of oil, etc.. The hole will continue to increase in size allowing more and more oil to rise into the Gulf. After several billion barrels of oil have been released, the pressure within the massive cavity five miles beneath the ocean floor will begin to normalize. This will allow the water, under the intense pressure at 1 mile deep, to be forced into the hole and the cavity where the oil was. The temperature at that depth is near 400 degrees, possibly more. The water will be vaporized and turned into steam, creating an enormous amount of force, lifting the Gulf floor. It is difficult to know how much water will go down to the core and therefore, its not possible to fully calculate the rise of the floor. Who is this Dr James P Wickstrom? What is he a doctor of? From what I can find out he's some extreme right wing, religious, racist, nutbag. I think I'll talk to a few 'real scientists' if I want an assesment of what is going on. Seems very convienient that the scientists he is supposed to be quoting, can't be named. Scared of the Obama government, yeah right. I'm questioning this 'Doctors' credibility. You are free to believe whatever you like, and if you choose to take your information from non-credible sources, thats your lookout. I can't see any experts rushing off to tell this guy about what is actually happening. IMO it is not plausable given his history. I would certainly be questioning his claim that scientists have sought him out as a means to get this information public, when there are many other more credible ways of doing this than spilling the beans to some internet blogger of dodgy background. As for his analysis of what he was supposedly told by these 'scientists', I think I'll do my own research on that, from sources that I know are credible and knowledgable, and I can speak to in person. What you have to realize is that we basically have state run media over here. The truth will never make it to the TV. only after it doesnt matter any more, if ever. Well if you have any knowledgeable “Real” scientists on the subject in your pocket over there from the other side of the world, who are willing to give you unabated testimony face to face, then by all means get on it and post your results here! Several of the scientists I know personally are headed over to the US this week, these are people who worked on several oil spills in Australia, including the spill in Bass Strait in 1995 and the recent spill, and continued leakage, off the coast of Western Australia, last year. These are scientists who are not 'owned' by any oil companies. There are also 2 scientists from the Netherlands and 3 from Germany, that also worked to stop the oil leak last year, heading to the US. What makes me wonder, is why it has taken this long for the US government to ask for outside help, particularly when experienced people offered to help several weeks ago. This is something worth investigating. Insofar as the spill is concerned, there are plenty of skimmers that can operate in eight-ft waves that could have, if deployed in sufficient numbers, have skimmed off the oil from the surface (i.e. without relying on dispersants which essentially just hide the problem under-water). Why were one hundred of those devices not deployed on standby within three days sailing along with tenders plus if necessary inflating bags to temporarily hold the oil. Those “mothers” can pick up 5,000 barrels of oil a day; and they can be dragged around using a GPS mandated routing controlled from the air. In a word they were not built. Although to be fair there were some skimmers (less effective than the ones not built) available in Holland, UK, and Norway, and they were offered. But the offer of help was rejected by both the Obama Administration (on a government to government level), and by BP. It’s hard to imagine why the Obama administration refused assistance; it’s almost as if they wanted the situation to become worse. Or perhaps it was because of the Jacobs Law which mandates that all of the oil-service vessels operating in the Gulf of Mexico; must have been made in America. Well then I truly do hope they are able to get through the Media Blockage and the WALL that they have put up to anyone and everyone from the outside getting to the truth of the matter. I am also floored as to why they have turned down all help from other countries. Not sure why but I have my ideas. "Divide and conquer from within." I would be willing to bet that that's certainly part of it. its obviously on purpose by someone high up. here is a lie for you - the POTUS is the most powerful person in the world. no way. Nothing is particularly obvious in this whole debarcle, but worth a bit of investigation. some things never change. they hide in the shadows for a reason. A "good" puppeteer always stays behind that black curtain - this is proof that the Wizard of Oz is just another fairy-tale - we see the identity of the coward. In real life? Never gonna happen. I question the claim that US scientists are forbidden, (by whom? 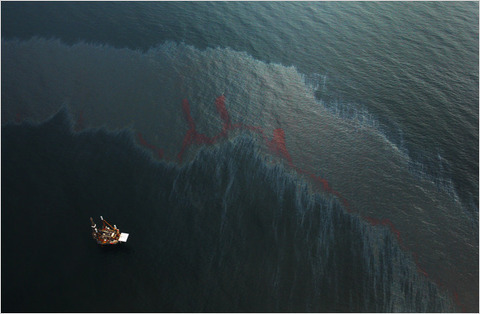 ), to tell anything that they may know about the gulf oil spill. There seems to be plenty of consultation going on between scientists in Aus, and the rest of the world, and scientists in the US. All of which is public information, and easily accessable, at least in Australia, and I haven't seen any evidence of any scientific findings being banned in the US. The only people who are spouting this are bloggers from dodgy web sites, such as this so called 'Dr' James. Fear mongering at its worst, but I would expect nothing less from 'Dr' James and his ilk. Not sure what it's like in Australia but none of that is happening in the US. What coverage that is on TV and all hard questions are ignored.